Synthetic peptide within pan Synuclein (N terminal). The exact sequence is proprietary. A synthetic peptide corresponding to near N-terminal of human alpha, beta, gamma Synuclein protein. Our Abpromise guarantee covers the use of ab15534 in the following tested applications. WB Use a concentration of 1 µg/ml. Predicted molecular weight: 17 kDa. Use at a concentration of 1 µg/ml for 2 hours at RT. IHC-P 1/50. Perform heat mediated antigen retrieval with citrate buffer pH 6 before commencing with IHC staining protocol. 1/50 for 10 min at RT. Boil tissue sections in 10mM citrate buffer, pH 6.0 for 10 min followed by cooling at RT for 20 min. Synucleins are small, soluble proteins expressed primarily in neural tissue and in certain tumors. The family includes three known proteins: alpha, beta and gamma synucleins. Synuclein-alpha is primarily localized at the presynaptic region of axons and it may be involved in the regulation of dopamine release and transport. However, it can form filamentous aggregates that are the major non amyloid component of intracellular inclusions in several neurodegenerative diseases (synucleinopathies). Synuclein-alpha may induce fibrillization of the microtubule-associated protein tau and it reduces neuronal responsiveness to various apoptotic stimuli, leading to a decreased caspase 3 activation. 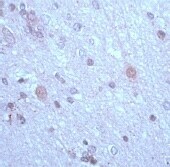 Synuclein-alpha is involved in Parkinson's disease, Lewy body dementia, Brain iron accumulation type 1 (NBIA1, also called Hallervorden-Spatz syndrome) and it is a major non-amyloid component of the deposits associated with Alzheimer's disease. Synuclein-beta may be a regulator of the SNCA aggregation process. It protects neurons from staurosporine and 6 hydroxy dopamine (6OHDA)-stimulated caspase activation that also involves p53 and contributes to restore the SNCA anti-apoptotic function abolished by 6OHDA. Gamma synuclein is found primarily in the peripheral nervous system and retina. High levels of expression have been identified in advanced breast carcinomas suggesting a correlation between overexpression of SNCG and breast tumor development. Immunohistochemistry (Formalin/PFA-fixed paraffin-embedded sections) analysis of human brain tissue labelling pan Synuclein with ab15534. ab15534 has not yet been referenced specifically in any publications. Publishing research using ab15534? Please let us know so that we can cite the reference in this datasheet. There are currently no Customer reviews or Questions for ab15534.